AAUW Work Smart is a successful salary negotiation workshop for working women in job transition and seeking promotions. One ingredient of the gender pay gap is women often don’t negotiate their salaries. We advocate on behalf of others with gusto, yet find it difficult to do the same for ourselves. This workshop teaches the skills to identify an individual’s unique skills, knowledge and experience; how to communicate these in an interview; how to value these in the salary discussion; and how to negotiate for a salary based on these unique attributes. This life-changing workshop is FREE and now ONLINE! AAUW Work Smart Online can be accessed through any computer or mobile device and takes about 90 minutes complete, giving participants the tools and skills they need to successfully negotiate their salaries. Take AAUW Work Smart Online. Even if the curriculum doesn’t seem directly relevant to you, take the course. You are a more effective ambassador when you share your personal perspective. And, your feedback is welcome. Commit to tell 20 people. Create a list of friends, contacts, coworkers, neighbors, daughters, granddaughters, daughters-in-laws, other relatives, and anyone else you. Don’t filter by saying – they wouldn’t be interested or they are looking for a job. You don’t know what is happening in their career, or who they know who could benefit, or when your mention is the spark to ignite a life-changing event. Be the spark in a women’s life. Adapt this template for sending an email. Challenge members to take AAUW Work Smart Online. Ask for show of hands at every meeting to celebrate the increasing numbers. Carve out 10 minutes of a branch gathering for members to brainstorm their list of 20 women to share. List template (from Lansdale). Promote AAUW Work Smart Online in newsletters, at branch meetings, via branch email. And, not just once. Repeat at every opportunity. You never know who is attending, reading, open to receive the message. Download and print these bookmarks using your Office Depot/Office Max benefit member discount. (Don’t have an Office Depot/Office Max in your town? Order on line and have documents shipped.) The bookmark is two-sided and best when printed on cardstock. 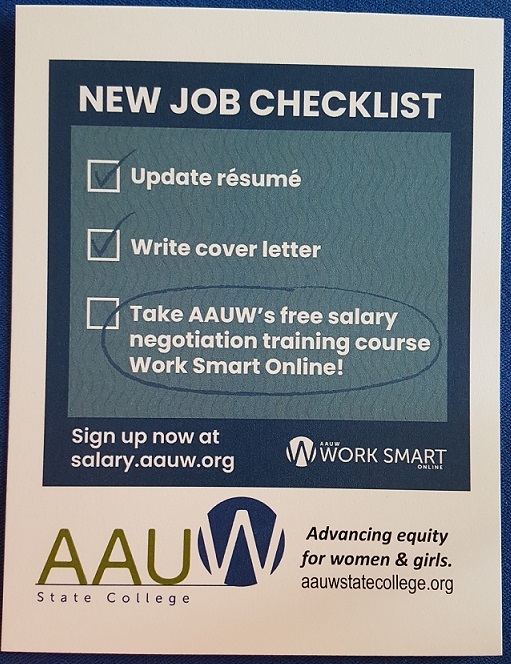 Distribute them at events, meetings, libraries and campuses to help spread the word about AAUW’s free online salary negotiation tool. Create your own item to share. 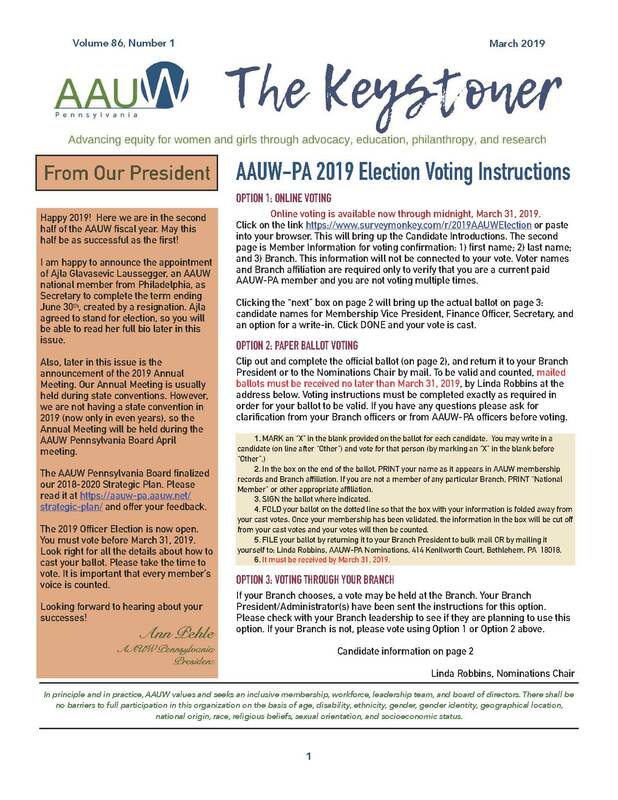 State College example—started with graphic from https://www.aauw.org/resource/mobilize-a-million-social-media/ and added their logo. Share content from AAUW National’s Twitter, Facebook and Instagram accounts on branch accounts. Share information with past scholarship recipients. Share information with organizations your branch collaborates with—past and present. Ask they share with their employees, mailing list, etc. Schedule a branch meeting and invite members to come with their laptops or tablets to take AAUW Work Smart Online together as a group. Flood local community information boards, like at your local library or community center. Informational flyer example (from Lansdale). Speak with library or community center staff about sponsoring a local “class” of AAUW Work Smart Online. Many libraries and community centers have computer labs and may be willing to schedule some dedicated time for residents to take the course. Write a media release and/or letter to the editor. Sample media release (from State College). And, here is how AAUW-PA …..